There are many, many questions and quality answers on SO regarding how to prevent leading zeroes from getting stripped when importing to or exporting from Excel. However, I already have a spreadsheet that has values in it that were truncated as numbers when, in fact, they should have been handled as strings. I need to clean up the data and add the leading zeros back in. Question: Is there an Excel formula to pad these 0's back onto these values so that they are all four characters? Note: this is similar to the age old Zip Code problem where New England-area zip codes get their leading zero dropped and you have to add them back in. However the TEXT function is able to do other fancy stuff like date formating, aswell. The more efficient (less obtrusive) way of doing this is through custom formatting. Highlight the column/array you want to style. Click ctrl + 1 or Format -> Format Cells. In the Number tab, choose Custom. Note that this does not actually change the value of the cell. It only displays the leading zeroes in the worksheet. I hit this page trying to pad hexadecimal values when I realized that DEC2HEX() provides that very feature for free. 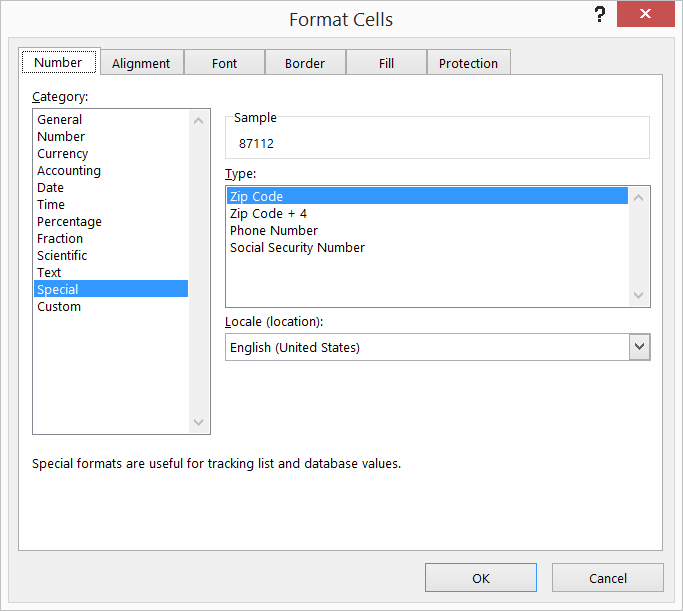 I am not sure if this is new in Excel 2013, but if you right-click on the column and say "Special" there is actually a pre-defined option for ZIP Code and ZIP Code + 4. Magic. I know this was answered a while ago but just chiming with a simple solution here that I am surprised wasn't mentioned. Whenever I need to pad I use something like the above. Personally I find it the simplest solution and easier to read. If you use custom formatting and need to concatenate those values elsewhere, you can copy them and Paste Special --> Values elsewhere in the sheet (or on a different sheet), then concatenate those values. where 2 is total number of digits, for 0 ~ 9 -> it will display 00 to 09 rest nothing will be added. Not the answer you're looking for? Browse other questions tagged excel padding or ask your own question. How can you make Excel 2007 stop formatting cells? Excel - Variable number of leading zeros in variable length numbers? EXCEL: Formula to get length of number as displayed in cell (incl. displayed leading zeros)?